Posted By:Unknown | At:9:19 AM Be the first to comment! 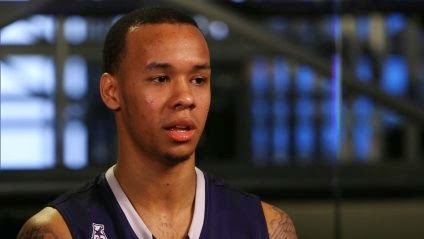 (Fox8) -- He’s one of the best basketball players in the country, and he’s preparing for Monday night’s NCAA championship game, yet the University of Connecticut’s Shabazz Napier recently told reporters he sometimes goes to bed “starving” because he can’t afford food. The remark got the attention of state lawmakers in Connecticut, who are now exploring legislative ways to allow athletes at UConn, a state institution, to unionize — much like athletes are attempting at Northwestern University. State Rep. Matthew Lesser and other state lawmakers are considering legislation that would allow athletes at the University of Connecticut to unionize, Lesser said. Unlike at Northwestern, a private institution governed by the National Labor Relations Board, Connecticut law governs whether employees at a public institution can unionize. In a recent interview with reporters, Napier called the Northwestern union ruling “kind of great” and said that while he appreciates his basketball scholarship, it doesn’t cover all of his expenses. “I don’t feel student-athletes should get hundreds of thousands of dollars, but like I said, there are hungry nights that I go to bed and I’m starving,” he said.